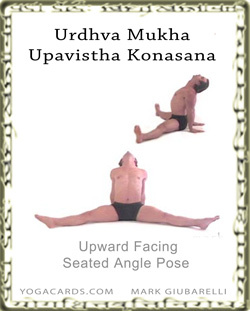 This yoga posture can be sequences well with many of the splits variations. It is nice to open the chest and shoulders after suppressing the area. There are also many Vinyasa flows that move in and out of this. This is a quick counter balance pose in many circumstances an example being Janu Sirsasana when one knee is bent and the spine is in a forward bend. The spine and knee are opened well so it’s a good counter pose or lead into your next posture. Fingers can be facing different directions for a slightly varied shoulder stretch.